I am thrilled to be here on my the second day of my Virtual Book Tour. What a way to start the day with this absolutely wonderful book review. Thank you for your interest and time. 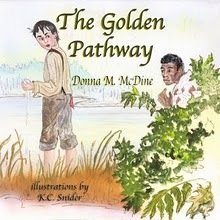 This is a wonderful book to help young children understand a part of our nation’s history. Best wishes on your tour. What a beautiful book review for an amazing and wonderful book. I couldn’t agree more! Wonderful review of THE GOLDEN PATHWAY. Donna I wish you much success with your book and the Virtual Book Tour. Thanks for stopping by everyone. I’m glad you enjoyed the review. I truly loved this book and will be recommending it to our school district. Donna, I wish you all the success in the world. Excellent review for what sounds like an excellent book. Definitely have to check that out. This book looks really interesting! I’ll have to pick it up for my civil war loving son! I confer with you! This book should be in every home and school. It is truly an inspiring story. Bravo! Great review. This is great! Lots of luck and tons of sales! Thank you for your wonderful words of support and for visiting today. We truly appreciate it. Nice review,, Cheryl, for a lovely book. It is one that will stay in my mind for a long time. Thank you for your heartfelt comments and for visiting today. I appreciate it very much! Thank you for hosting me today. It’s been my pleasure to be here. Most of all thank you for the wonderful review! Anytime, Donna. You’ve written a great book and you should be very proud. Well said, Cheryl, that kids (and adults!) in every home and school would benefit from reading this book. Donna has written an amazing story. I think this is an award winner. Great book! Donna, I’m sure will book will be a great success. Thank you for stopping by and for your lovely words of support. I truly appreciate it!